Run for our street children! 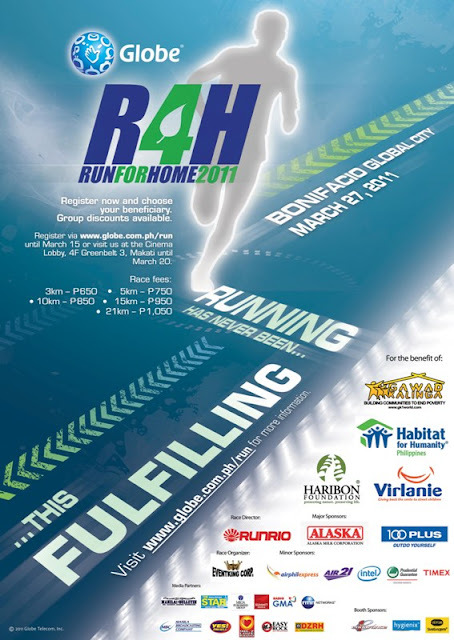 Build a home for street children through Globe's Run4Home 2011! Choose Virlanie as your charity when you register to participate in the run! 1.) For physical registration, go to 4th Floor of Greenbelt 3 Cinema Lobby from February 28 to March 20, 2011 from 12nn to 8pm and fill up the registration form and pay in cash for individual or group. Race Kit can be claimed upon registration. 2.) For online registration, log on to www.globe.com.ph/run and pay via credit card from February 21 to March 15, 2011. This may also be done for group entries. Race Kit will be delivered to the specified address of online registrants in 8 working days upon payment. Online registration is recommended for participants who are based outside Manila. Delivery fee will be charged on top of the registration fee. Delivery fee for Manila is P125 and for provincial it's P185. Choose Virlanie Foundation as your charity and part of your registration fee will help build a home for street children! Run for street children! Share and invite your friends, family, classmates, or colleagues! To learn more about Virlanie and Globe's Run4Home, visit www.virlanie.org.